There seem to be many steps here. This conceals the fact that this Christmas dessert is ludicrously, dazzlingly easy to make: it doesn’t require cooking or technical brilliance: it is merely an assembly job. Not that you need to be advertising this fact to appreciative eaters. Using a serrated knife, cut the panettone roughly into 1cm slices, then use about a third of these to line the bottom of a 23cm/9in springform cake tin. Tear off pieces to fit so that there are no gaps: panettone is fabulously soft and mouldable, so this isn’t a hard job. Drizzle two tablespoons of the Tuaca (or other liqueur) over it so that the panettone lining is dampened. It looks like a beautiful golden patchwork made out of cake. Now get on with the luscious filling. Whisk – using a freestanding electric mixer for ease- the eggs and sugar until very frothy and increased in volume and lightness. More slowly, whisk in the mascarpone and double cream, then gradually whisk in the Marsala and carry on whisking until the mixture is thick and spreadable. Remove 250ml (a good cupful) to a bowl or other container, cover and put in the fridge: this is for the top layer, which is not added until you serve the cake. Crumble the marrons glacés into the big bowl of mascarpone cream mixture, followed by 100g of the chocolate chips and 75g of the chopped pistachios, and fold in. Use half of this creamy filling to top the panettone layer that is lining the cake tin. Use another third of the panettone slices to cover the cream filling, again leaving no holes for the cream to escape through. Dampen with another two tablespoons of liqueur. Spoon on the other half of the cream mixture and spread it evenly. Then top with a third and final layer of the panettone, covering the cream as before, and drizzle over it the last two tablespoons of liqueur. Cover tightly with cling film, pressing down on the top a little, and put in the fridge overnight or for up to two days. When you are ready to serve, take the cake out of the fridge, unmould and sit it on a flat plate or cake stand, then spread with the reserved mascarpone mixture. Don’t try to lift the cake off the base as the panettone slices at the bottom are too delectably damp. 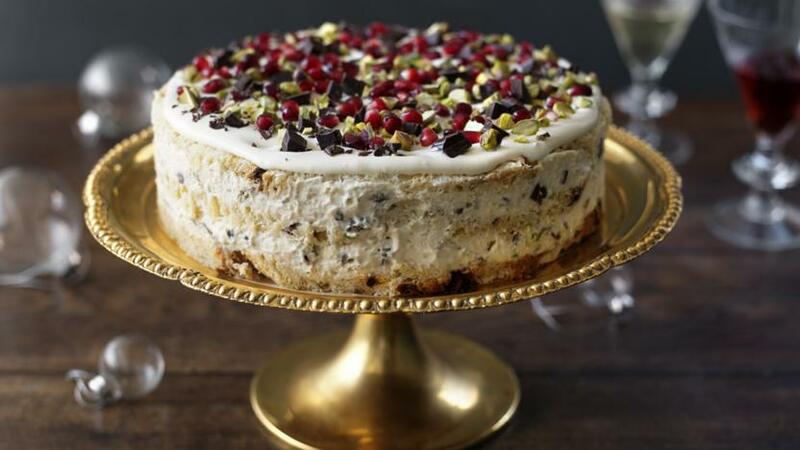 Scatter the top – and all around the cake, if wished – with the remaining chocolate chips and chopped pistachios and your pomegranate jewels. These sprinklings also provide beauteous camouflage for any less than aesthetically uplifting edges of the springform base which may be visible.